The salt comes packaged in a 100% cotton bag. A 4-6 month supply. The Original Himalayan Crystal Salt® Stones are the easiest - and most aesthetically beautiful - way to make your Sole, which can also be used as a "liquid salt" for all of your cooking and culinary uses. Are captivating pink diamond-like crystals that from an exclusive source deep within the Himalayan Mountains. 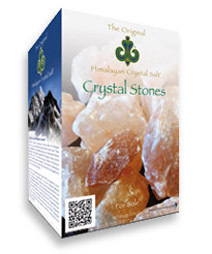 Are truly precious natural crystal salt with supreme bio-energetic properties. Contain 84 minerals and trace elements essential to your body’s health. Possesses a perfect crystalline structure, resulting in perfect Energy for your body. Restores your body’s alkaline balance and replace electrolytes naturally. Are hand-mined with respect for Nature, the environment and the workers. Ordinary table salt imposes a huge burden on the body - Because it is bleached and chemically stripped of everything that might be beneficial, it introduces additional toxins, into the body, that are difficult to be expelled completely or easily. Himalayan Crystal Salt - is nutrient dense with all the beneficial trace elements and minerals identical to what is present in sea water (without the toxins). It provides to the body 84 trace elements and nutrients which can be easily absorbed and utilized. Sodium Chloride (NaCl) causes dehydration - Uric acid is formed when the body is trying to expel excess table salt. The body will then pull the water from the cells in an effort to stop the damage by ionizing the substance into chloride and sodium. Because of this, cells can become dehydrated and eventually die since table salt does not contain anything that would stop the excessive transfer of water out of cells. Himalayan Crystal Salt - does not present this problem of dehydration. Instead it will regulate the amount of water that's allowed to pass through cell walls thus preserving optimal balance. The body does not need to metabolize the crystal salt in order for its energy to enter directly into our cells. Salt has a very unique property. In contrast to all other crystalline structures, the atomic structure of salt is not molecular, but electrical and it is this that makes it very transformable. When a crystal of Himalayan salt is placed into water, it dissolves and creates Sole which is the liquid materialization of the sun's energy. Sole is not water nor is it salt. But instead a higher energetic dimension than either water or salt. When the Sole evaporates, it leaves behind the salt, exactly as it was. This transformability of salt ensures that it doesn't have to be metabolized in our body. Sole /so-lay/ is an excellent product for balancing the pH factor of your body. Sole can also help to get rid of heavy metals such as lead, mercury, arsenic, amalgam and calcium because the crystal salt is able to break up their molecular structures. For the body to get rid of these deposits it has to first metabolize them. Even animal proteins, which are difficult to break down and eliminate, will be eliminated through the urine due to the strong structural formation of the crystal salt. With the sole, you can have exactly that vibration pattern that the body is lacking when it is sick. But again, the quality of the salt is paramount for quality sole. Everyone knows that salt dissolves in water, right? Sole is super-salty water. Here’s how to make it. Fill a small glass jar with Original Himalayan Crystal Salt Stones. We recommend a small, wide-mouthed jam jar with a lid. Then fill the jar with your preferred drinking water, completely covering the salt crystals with water. Let sit for 8 hours (overnight). That's it! After some time, with daily use, you'll need to add more water. There should always be undissolved salt crystals on the bottom of the jar. This is your visual indication that the water is totally salty. After some time, with daily use, you will need to replenish the water in the jar. Eventually the salt will dissolve. At this point just empty the jar and make some new Sole. CAUTION! Never add a teaspoon of Original Himalayan Crystal Salt to a glass of water thinking that you're taking Sole. You are not. Sole is something completely different. One teaspoon of Sole contains only 478 mg of Sodium - That’s equivalent to 20% of the USDA’s recommended daily maximum of 2,500 mg. Whereas 1 teaspoon of Original Himalayan Crystal Salt contains 2,292 mg of sodium! Adding Salt to Water Has Neither The Effects Nor The Benefits of Adding Sole to Water! Each morning, before eating or drinking anything, add one teaspoon of the Sole to a glass of your preferred drinking water. Your body will receive the energetic vibration pattern of the Original Himalayan Crystal Salt sole and hold it for 24 hours. Keep the container covered to prevent the water from evaporating. Otherwise, no special storage is needed. The Sole will keep forever ! Salt is a natural anti-bacterial and natural fungicide. It simply cannot spoil or go bad. When the percentage of concentration of the Sole are talked about in the book Water&Salt-The Essence of Life, they mean the ratio of water to salt. Sole = A fully saturated solution of water and Original Himalayan Crystal Salt. The water becomes saturated with salt when the water can no longer dissolve more salt. At this point, the salt crystals remain un dissolved on the bottom of the jar, indicating that the solution has reached it’s saturation limit. The water is now fully saturated with salt. This is what we call Sole. Sole Solution = When we speak of a sole solution, we speak of a diluted quantity of the concentrated Sole in water. When we take the fully saturated Sole and add water to it, we create a Sole solution. Many of the therapeutic application for the OHCS require a Sole solution. How To Make Various Concentrations of SOLE SOLUTION For Various Applications Using Our Fine Granulated Original Himalayan Crystal Salt. Gargling - Stir 1/2 teaspoon salt in an 8-ounce glass of warm water for use as a gargle for sore throats. Bathing eyes - Mix 1/2 teaspoon of salt in a pint of water and use the solution to bathe tired eyes. Tooth Brushing - Brush daily with salt solution. This harmonizes over-acidity, soothes gum bleeding and reduces periodontal disease, bad breath. Reducing eye puffiness - Mix one teaspoon of salt in a pint of hot water and apply pads soaked in the solution on the puffy areas. Relieving tired feet - Soak aching feet in warm water to which a handful of salt has been added. Rinse in cool water. Relieving bee stings - If stung, immediately wet the spot and cover with salt to relieve the pain. Treating mosquito and chigger bites - Soak in saltwater, then apply a mixture of lard and salt. Treating poison ivy - Soaking the exposed part in hot saltwater helps hasten the end to poison ivy irritation. For Food & Baking - Use as you would any table salt as a food seasoning as well as for all of your cooking and baking needs. Each 100% cotton bag, enclosed in a sturdy box that is sealed, contains 1 kilo (2 lbs. 2.35oz.) of finely granulated Himalayan Crystal Salt, enough to last the average family many months. A. One teaspoon of Himalayan Crystal Salt™ Sole contains approximately 411mg of sodium. This very small amount of salt has an incredibly positive effect on your whole body, and normally, does not cause any danger even when taken regularly. But be careful about using commercial table salt. The USDA recommend a daily intake of no more than 2,500mg of sodium depending on your body weight. Himalayan Crystal Salt™ can be more readily metabolized by the body than refined table salt. This is the reason that it should also be used for seasoning your food and for all your cooking and baking needs. An exception to this rule is when the kidneys are not functioning properly. Also, when high blood pressure is based on too much salt intake (which applies to about 3% of all high blood pressure cases. When in doubt, one should consult with a doctor. A. Black teas and green teas are acidic like coffee and have strong diuretic effects. The best is to drink an herbal tea after the sole. Q. How many time can one heat or freeze the salt sachet? A. The human body needs only as little as 500mg of sodium per day or 1/4 teaspoon of our Original Himalayan Crystal Salt. Rather, we tend to use too much salt than too little. As opposed to refined table salt, you can use Original Himalayan Crystal Salt more freely because of its holistic properties which make it easy for the body to assimilate. The Himalayan Crystal Salt can even help the body to eliminate the stored refined salt deposits. The daily need for crystal salt varies from person to person. Season your food to taste as you like. Contrary to refined table salts, you can use the crystal salt freely. With the recommended one teaspoon of Himalayan Crystal Salt sole every morning, you are not only receiving the biophysical aspect of the salt, which is the frequency pattern of the crystal salt, but also the biochemical aspect of the salt, containing sufficient minerals and trace elements. The body will hold the frequency pattern of the crystal salt sole for 24 hours. Therefore, we only take the sole once per day on an empty stomach. Patients on Dialysis, or with high blood pressure, should generally use very little salt. Q. I am wondering what would be the effects of taking the sole when pregnant if any. I guess is it safe for someone who is less than three months to start taking the sole now and througout the pregnancy. I couldn't find anything pertaining to this in the book could you please advise. A. Unless your doctor has told you to eliminate salt from your diet, there’s no reason to have any apprehensions about taking a teaspoon of Sole each day. It’s mostly the sodium that doctors warn patients about. The average American adult consumes about 5,000mg of sodium daily, derived from processed, poisonous salt. The USDA recommends no more than 2,500mg per day of sodium. Based on these facts, most Americans are using excessive amounts of sodium. One teaspoon of Original Himalayan Crystal Salt Sole contains about 412mg of unprocessed, natural sodium. The USDA also states that the body absolutely requires a minimum of 500mg of sodium per day just to live. Sodium is fundamental to our very existence. In fact, we could not live without it. So when choosing your source of sodium for your daily need, I believe that you’re wise in choosing to take the Sole each day. The effect of the Sole will be that your body will have balanced energy, the perfect foundation for keeping your body at its maximum level of energy necessary to carry you through your pregnancy. It’s better to have natural sodium with its 84 minerals and trace elements running through your veins and the forming veins of your baby than a harmful, processed salt. Did you know that the blood in your body is composed of a 3% Sole solution? And, that the same 84 minerals that are in our salt are found in your bloodstream? Q. Is Original Himalayan Crystal Salt kosher? A. Salt of itself cannot be kosher? Salt is used for koshering foods. All salt can be considered as kosher. Salt is used, according to the guidelines in the Torah, the book containing the sacred writings of Judaism, for drawing the blood out of meats. Because salt attracts water, and blood is mostly water, salt does an excellent job of pulling the blood out of meat, which is a condition for meat to be condisered kosher. It's common to refer to larger grained salt as kosher and most salts used for koshering foods are large grained. The larger "cubes" or grains of salt have more surface area for which to cover the meat being koshered, making the koshering process more expedient. Our Coarse Granulated Original Himalayan Crystal Salt is excellent for koshering foods. Q. One can often find reddish deposits at the bottom of the container of the concentrated Original Himalayan Crystal Salt™ Sole solution. What is this? A. Himalayan Crystal Salt is a natural product and subject to changes in concentration of its elements held within the crystalline structure. Not all minerals are represented in a 100% ional/colloidal form. These deposits represent minerals that were not included in the geometric matrix of the salt crystal. These minerals are in an inorganic form which fall to the bottom of the container when the salt crystal dissolves. The deposits are totally harmless. Q. Can I use a higher concentration Original Himalayan Crystal Salt Sole solution than 1% for frequent hand and foot bathing? Q. Can I also take the one teaspoon of Original Himalayan Crystal Salt Sole concentrate undiluted, without adding it to a glass of water? Q. Can the Original Himalayan Crystal Salt also be given to animals? A. Just as with humans, the natural crystal salt will have its positive effect on the animal body. If you put a few drops into the food, it will increase the vitality and strengthen the immune system of your pet or animal. Q. Can I use the Original Himalayan Crystal Salt Sole therapy along with my fasting? A. The Himalayan Crystal Salt™ Sole therapy is a good complement to fasting. It helps to eliminate the toxins and also provides vitality and support to the body as it labors to rid itself of toxins. Just be sure to drink sufficient amounts of water while fasting. Q. Does coffee have a negative impact on the Original Himalayan Crystal Salt Sole therapy? A. One of the primary benefits of drinking the Himalayan Crystal Salt™ Sole in the morning is the balancing of the body’s pH level. Coffee is very acidic and a known diuretic. By drinking coffee in the morning you will partly cancel out the benefit of the Sole. Every body has a different disposition and tolerates poisons more or less. Everyone has to make their own decision as to how they treat their body. Q. Can I drink the Original Himalayan Crystal Salt Sole in the evening instead of in the morning? A. The benefits of the Sole therapy are realized best when taken on an empty stomach. You can also do the Sole therapy in the evening but you should keep this rhythm as the body maintains the frequency pattern of the salt for 24 hours. Q. I have very severe vericouse veins. My doctor has told me to avoid warm bathing. Does this also apply to crystal salt bathing? Q. Hi there, I have ordered the salt. I have a couple of questions. I am a diabetic. I know that I am suppose to drink the sole on an empty stomach. How long after I drink the sole can I take my meds and eat. I am excited to get started on a new healthy program. A. If you decide on mornings, all you need to do is to wait for 5 minutes after drinking the Sole to begin with your normal regime. Q. I was wondering what the effects of the salt bath might be for someone with skin disorders. Would it be better to use the sole for a while and see those effects before taking a full-on bath? Also, does the sole or bath salt help with cold sores and fever blisters? A. Taking the Sole every day is the most important and fundamentally essential therapy for anyone, regardless of their current state of health, especially for someone like yourself, suffering from skin disorders. Bathing in Original Himalayan Crystal Salt would be the most beneficial therapy you could do for skin disorders, in combination with the Sole drinking each day. Just start taking the Sole internally each day as a beginning step. I personally think that you'll find a bath to be the most obviously helpful approach. Doctors have been prescribing salt bath for hundreds of years to their patients for a variety of skin disorders. Imagine, bathing in the primal ocean of 250,000,000 years ago. Our salt is the byproduct of the evaporation of the Primal Seas. The minerals in our salt have full bioenergetic potential, as the Earth's oceans at that time were vibrant with life energy. It's this energy that our body is looking for. Q. you have any information regarding the re-mineralization of reverse osmosis water with the sole made from your Original Himalayan Crystal Salt. How much sole could you add to drinking water to re-mineralize without creating a salty brine solution ? A. Interestingly, we’re working with a water bottling company who uses our Original Himalayan Crystal Salt™ as part of their process for “rebuilding” water that has undergone double distillation, completely stripping the minerals and their “memory” from the water. They measure the ppm (parts per million) of solids in the water to achieve the desired levels of minerals, which are necessary for the next step in their patented process, electrolysis. The minerals in the salt, each having their own unique frequency or vibration pattern, are ionized, and the complete spectrum of frequencies of the 84 minerals are “held” in the water, giving it its energetic properties. For your application, I would recommend 1 teaspoon of Sole for each gallon of water. This will give you approximately 200ppm of dissolved solids. This will put the necessary minerals back into the water without affecting the taste. Q. I have been buying your mineral salt and I and my family have been using it in place of our regular sea salt. Recently I purchased a 2 pound bag (1 kilo) of small stones and when I went to grind it I saw several small rock formations. But after tasting them I realized they were not only different in color than the other rocks, but they also did not have the salt flavor...they were not salt rocks!!! What were they? That is my concerned question to you! Do you add some sort of "non-caking" compound to the salt? I am very concerned about how much of this mystery stuff we have eaten and what is it!!!??? A. Nothing is added to the salt. Our Original Himalayan Crystal Salt is hand-mined and hand-prepared and comes to you exactly as it comes from the mine. The small, hard particles sometimes found in our “Stones” are natural mineral deposits that have not been fully absorbed into the crystalline structure and appear as inclusions in the salt. These are rare and are totally harmless. Normally, these do not occur in the smaller grinds of our salt as they are discarded in the sorting process. The Stones are used for making Sole solution by dissolving them in water. In this process, the solids that have not dissolved fall to the bottom and can easily be discarded. But if the Stones are used for grinding, and one of them has such an inclusion, just pick it out and discard it. We hope that you recognize the larger benefits associated with using our unprocessed, pristine, and holistic salt, rather than this small inconvenience. Q. What kind of saltshaker should I use to preserve the frequency pattern of the finely ground salt and any info stating that grinding “just in time” would provide a higher vibration.